Should my belt match my shoes? If your belt is brown or black you should wear corresponding brown or black shoes. But this rule only applies to traditional colours such as brown, black and tan. Don’t go buying some extravagant green brogues purely because you have a green belt. If you go too ‘matchy-matchy’ it’ll look forced. Another point on belts: don’t wear dress belts with jeans. It looks naff. Which button should I do up on a suit jacket? 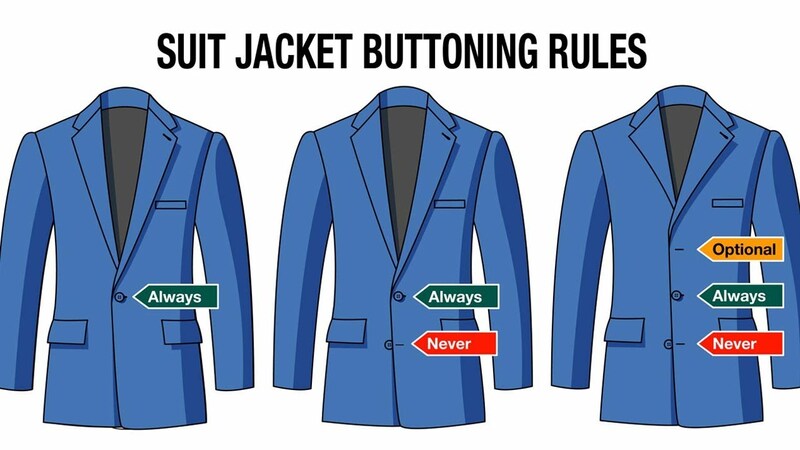 If it’s a two-button, leave the bottom undone. If it’s a three-button, leave at least the bottom button undone. If it’s a one-button, use your damn brain! Oh, and always undo your jacket when you sit down. SOMETIMES the top button, ALWAYS the middle, NEVER the bottom. Should socks match my shoes or my trousers? As a general steer, your socks should be a continuation of the trouser – albeit in a slightly different shade. You can’t go wrong if you follow this advice. As you acquire more sartorial nous you can start introducing different patterns and colours, but if you’re starting out play it safe. Another point on socks: no white socks. Ever. Look at this. Case closed! I mean ‘I rest my case’. Can I wear boat shoes with socks? Good god, no. Boat shoes are a risky enough business as it is, so pairing them with socks is almost at ‘socks and sandals’ levels of wrong. If you need socks with boat shoes it’s either too cold to wear boat shoes, or your ankles are not tanned enough to pull off boat shoes. Do you have any questions? If so, put them in the comments below and i’ll get around to answering them in the next FAQ post.